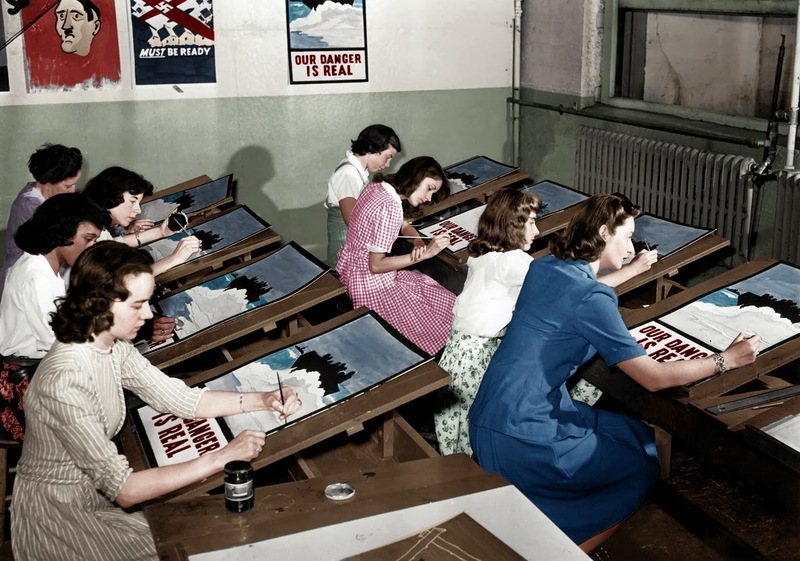 Making propaganda posters, Port Washington, New York, 1942. A room full of women are hard at work emulating the “real danger” present in the master poster hanging in the background. It looks like some kind of class, like a high school or college art class. They may be all working on the same poster because they’re making multiple prints at the same time. To be honest, having that many people working on that many prints at the same time may be faster and more efficient than having a machine do it with the technology of the day. Not to mention the fact that the machine requires using valuable resources, while many people would be willing to do this sort of thing to support the war effort. Propaganda is most well-known in the form of war posters. But at its core, it is a mode of communication aimed at influencing the attitude of a community toward some cause or position, and that doesn’t have to be a bad thing. Although propaganda is often used to manipulate human emotions by displaying facts selectively, it can also be very effective at conveying messages. During World War II, American propaganda was used to increase support for the war and commitment to an Allied victory. Using a vast array of media, propagandists fomented hatred for the enemy and support for America’s allies, urged greater public effort for war production and victory gardens, persuaded people to save some of their material so that more material could be used for the war effort, and sold war bonds. Patriotism became the central theme of advertising throughout the war, as large-scale campaigns were launched to sell war bonds, promote efficiency in factories, reduce ugly rumors, and maintain civilian morale. When World War II began, most Americans viewed propaganda as a tool of totalitarian dictatorships. Furthermore, many remembered with hostility the fervor of World War I propaganda efforts, which were later regarded as violating basic rights as well as conveying misinformation. At first, the government was reluctant to engage in propaganda campaigns, but pressure from the media, the business sector and advertisers who wanted direction persuaded the government to take an active role. Even so, the government insisted that its actions were not propaganda, but a means of providing information. These efforts were slowly and haphazardly formed into a more unified propaganda effort, although never to the level of World War I. In 1942, President Franklin D. Roosevelt created the Office of War Information (OWI). This mid-level agency joined a host of other wartime agencies, including the War and State Departments, in the dissemination of war information and propaganda. Officials at OWI used numerous tools to communicate to the American public. These included Hollywood movie studios, radio stations and printing presses. ‘To be honest, having that many people working on that many prints at the same time may be faster and more efficient than having a machine do it with the technology of the day.’ Hardly, the first offset colour printing press was introduced in 1932, and in one hour could produce far many more posters of this sort than a roomful of people could in a day.